-I use ground turkey... You can choose whatever protein you and your family like! In a small bowl, mix together the Thai red curry paste, soy sauce, fish sauce, and garlic powder. Set aside. If using, mix together the dipping sauce ingredients in a separate small bowl and set it aside, too. Both sauces may be prepared 2-3 days in advance, covered and refrigerated. In a large sauté pan coated with olive oil, cook the mushrooms and onion over medium to medium-high heat, stirring regularly, until the mushrooms release all their liquid and are nicely browned, about 8-10 minutes. Add the ground beef, and continue to cook until the meat is browned, breaking it up as it cooks. When the meat is about halfway cooked, stir in the curry paste mixture (not the dipping sauce if you mixed that up, too), stirring to evenly coat the meat. 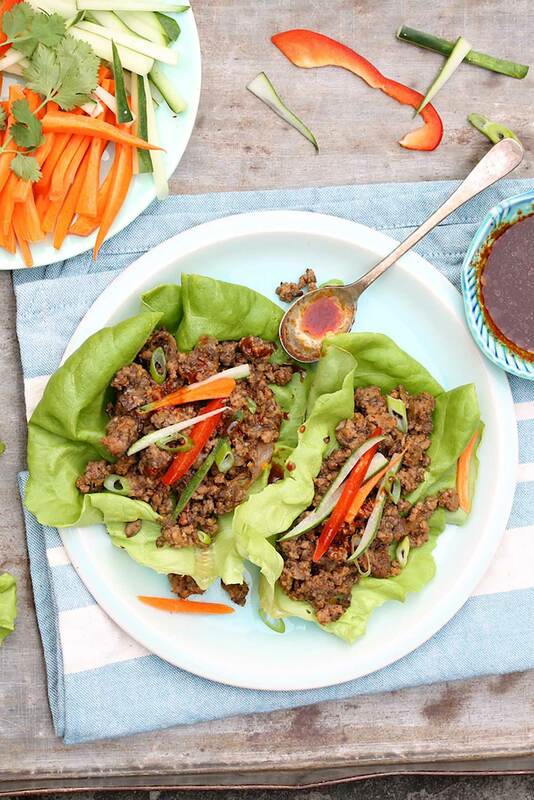 To serve: scoop some of the meat mixture on top of individual lettuce leaves. Top with the julienned vegetables and other toppings of choice. Roll the lettuce around the filling (sort of like a burrito) and enjoy! *For a soy-free option to soy sauce, coconut aminos work well. The taste is not a spot-on replica but quite similar. I used this in place of soy sauce for someone with a soy allergy no one noticed the difference in this dish. It’s a lower-sodium, gluten-free option as well. **For the dipping sauce, my original recipe called for chili paste instead of sriracha sauce. Since this is a condiment I rarely use–and I figured it might be one that others would have to buy just for this recipe–I tried several substitutes. Sriracha sauce is my favorite; the Thai red curry paste used in the meat mixture is delicious, too, for those who prefer no spiciness. All of these items can be found in the Asian section of most large grocery stores.